Whether it's slow, intermittent, or not working at all, there are few things more frustrating than a dodgy broadband internet connection! They can make life very difficult and even cost money if you rely on internet for work. In this guide we’ll look at ways of speeding up slow internet, examine the common faults which can affect broadband and phone lines, and help you troubleshoot these issues so you don’t have to wait in a queue for tech support. The first step to fixing slow broadband is testing your current broadband speed and comparing it against the speed you should be receiving. If you signed up for a broadband service within the last few years you should have been given an estimated speed. Rather than the average speed figures used in broadband advertisements, this is a far more accurate representation of the true performance. If you can’t find a record of this or were never given one, get in touch with the Internet Service Provider (ISP) and ask them what speed you should be receiving. Armed with this information you can then use our broadband speed test to see how your connection is actually performing. Before running a speed test shut down other devices connected to the router, and close any unnecessary software applications. Run several tests throughout the day to get an average figure. Slow broadband can have all kinds of causes, from technical faults to limitations of the service to problems outside the ISPs control. If the broadband is significantly slower than usual the cause may be software or other devices connected to the network. Certain applications, especially file sharing software, can use a lot of bandwidth. Traffic shaping, or traffic management, is used by internet service providers to control performance by prioritising certain tasks or slowing down especially demanding activities. If you find that the broadband is only slow with specific applications (especially file sharing) then traffic management may be the cause. Not all ISPs use traffic management so if this is a problem you might want to consider a switch to a different internet provider. If a particular web site or service is being especially sluggish but everything else is normal then the problem almost certainly lies outside your broadband connection. In that situation the only thing to do is wait until it’s fixed. Sometimes the broadband will be slow or inoperative due a problem with the provider, the telephone/fibre/cable line or the wireless network. Some ISPs display service status on a web site so you can check; you'll find links to a few at the end of this page. Wi-Fi is undoubtedly useful but it can often be the cause of slow broadband. Sometimes routers stop functioning for no clear reason, or you may experience problems with signal strength. Web browsers could be the cause of sites failing to load or displaying incorrectly. Web browser extensions can interfere with a site, the browser may be outdated and require patching, or the site may be incompatible or poorly coded. If a particular web site or service is being especially sluggish but everything else is normal then the problem almost certainly lies with them, not your broadband connection. In that situation the only thing to do is wait until it’s fixed. Malicious software (malware) such as viruses and spyware can have an impact on system performance and internet speed. Poor router security could allow unauthorised use of your broadband connection, slowing it down for everyone else. Like a road, a broadband connection is subject to rush hour traffic. At peak times you could find that the service is noticeably slower. Peak time is typically from morning to mid-evening, though each ISP has its own definition. Is your broadband service faulty? 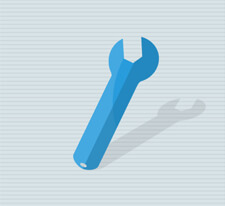 This is an IT cliché for a reason - power cycling hardware or restarting software is often a quick and easy fix. Routers and other networking gear (particularly powerline adapters and Wi-Fi boosters) can frequently be coaxed back to life by switching them off and on again. However, do try other solutions before jumping straight to rebooting the router - routers can take a little while to restart, and you will disrupt the network for everyone who uses it. Get rid of old hardware and software once it’s no longer needed, or at least make sure it’s not active and connected to the internet. Certain software applications can use up a huge amount of broadband bandwidth. Streaming video (Netflix, iPlayer and so on) is very demanding, as is file sharing. Software updates - particularly operating system patches - can also generate a lot of network traffic and will often run automatically. You can usually pause them, but keeping software up to date is important so don’t forget to resume when it’s convenient. Poor Wi-Fi signal can be improved by repositioning your Wi-Fi router. Ideally it should be in a central point in your home, away from walls and other electronics which could interfere such as cordless phones and large appliances. A Domain Name Server (DNS) is used to translate web site URLs to IP addresses. So when you type google.com the web browser retrieves the server IP via DNS and loads the page. By default your router will use the ISPs DNS server, but these aren’t always the quickest. Instead you can switch to a public DNS such as Google which can help pages load a little faster. Some DNS services also offer additional security features and parental controls. Slow Wi-Fi speeds can be caused by nearby Wi-Fi networks sharing the same channel as your router. Use the router’s admin controls to switch to a quieter channel. A Wi-Fi toolbox app for smartphones (such as Wi-Fi Analyzer) can show which channels are busiest. Wi-Fi routers can also operate on different frequencies - 2.4GHz and 5GHz. 2.4GHz offers the best range and signal penetration but has slower speeds. 5GHz is faster and less prone to interference, but has a shorter range and may not be supported by older devices. Many modern home broadband routers are dual-band, which means they support both frequencies. Select the most appropriate frequency for your home - 2.4GHz for coverage and range, 5GHz for speed. It is possible to operate both a 2.4GHz and 5GHz network at the same time so you can choose the best connection for each device. Sometimes a Wi-Fi outage will occur for no clear reason, but often it can be fixed by simply disconnecting and reconnecting Wi-Fi on the device or by restarting the router. If it’s an ongoing issue it might be due to poor signal strength. Wi-Fi boosters are an easy and affordable way to increase the range. A powerline Wi-Fi booster can also be used to extend the signal far beyond its usual range by transmitting data over the electrical circuits. The router could also be old and lack support for faster data transfer speeds, in which case upgrading to a newer model can provide improved speed and signal strength. If your router is supplied by the broadband provider speak to them about an upgrade. To eliminate malware as the cause of broadband slow-down your anti-virus software should be set to automatically update and scheduled to perform regular scans. It’s not necessary to pay for anti-virus software. Free AV applications (such as Avast or AVG) are usually all anyone needs. Because Wi-Fi can be accessed outside your home it’s very important to properly secure the Wi-Fi router. Regularly update the router firmware. For more information read our full guide to securing Wi-Fi routers. Wired network cables can provide a faster and more reliable connection than Wi-Fi. It’s not so convenient for portable devices, but for desktop computers, games consoles or anything else that doesn’t move around much a wired connection is often best. Powerline adapters offer an easy way to create a wired network without having cables strung around your home. First check the obvious stuff. Is the telephone cable securely in the socket? If you’re using a cordless phone, do the batteries need replacing? Next, remove all devices from all phone sockets then plug a phone directly into the master socket. If there’s still no dial tone you can try accessing the test socket which is available on some phone points. If your faceplate looks like the one pictured here, the lower half of the faceplate can be unscrewed to get direct access to the test socket. If there is still no dial tone, or you do not have an accessible test socket, contact the phone service provider. If you do get a dial tone while connected to the test socket, the fault is with your internal wiring or equipment. Ensure all devices connected to the phone line have a micro-filter fitted (if the phone point is not pre-filtered). Check that the problem is not occurring only with one phone - this is a problem with the phone rather than the line. If it only happens when calling a particular number, it’s probably not a fault on your line. 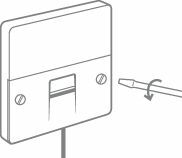 As with dial tone issues, remove all other device connected to the phone points and plug into the test socket. If the line noise is still present speak to your phone service provider. If it’s gone, the problem is with the equipment or lines inside your home. If you’ve eliminated technical faults as the cause of slow broadband it may be time to think about an upgrade. Speak to your current provider before doing anything else. They may be able to upgrade your service to a faster connection or package, which is going to be a lot quicker and easier than switching to another ISP. Our guide to customer and technical support has the contact details for many providers. If your ISP can’t offer anything better it’s time to look at what else is out there. To get started enter your postcode into our broadband deal comparison table to find out what’s available in your area.